Available in both Business and Platinum Select versions. 1-800-324-3405 for CitiBusiness. Valid through 7/31/06. $75 annual fee. 1-800-848-5536 for Platinum Select. Valid through 7/31/06. $85 annual fee. 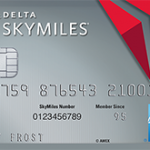 It’s been pointed out that the value of this offer relative to the offer for 20,000 miles and no annual fee is debatable, since you’re essentially paying $75 for 5,000 miles which is not a great deal. If you’re interested in applying online or want to see the full terms and conditions, the direct link is here.